As I sit here at 11am about to tuck into a massive burger I reflect on what a great occasion my first marathon experience was. We arrived the the day before the race and joined some of the other club members for a meal that evening. This helped to reduce some of my pre race nerves as other members shared their marathon experiences. As my wife will testify I had been a bit of a nightmare in the build up to race day as 'maranoia' set in and I tried to avoid any contact with people who had the slightest sniffle! We all arranged to meet at Old Trafford for a team photo on the morning of the race and after a somewhat sleepless night I set my alarm early so I could eat some porridge before heading out. Although a little cold first thing it was dry and the sun was shining. It appeared to be perfect conditions although I think some of us would rue the heat later in the race. Team photo done and good luck wishes said to the other runners I headed to the start with a plan A,B and C in mind. I felt good so I was always going to go for plan A. My wife, parents and best mate had come to spectate and along with Team Chardonnay no further motivation was needed. The gun went and the lines of runners moved slowly up to start line then we were under way. The crowds around the course were fantastic and seeing family and friends was a welcome bonus. That's a big plus for this marathon as the infrastructure allows supporters to get around to various points of the course. I focused on each mile and the first half flew. As I ticked off mile 17 then 20 my splits were bang on target and I could see plan A in sight. Unfortunately that was when the wheels came off! Just before mile 21 my right quad cramped. This was a new experience for me and not a nice one! I stopped and tried to stretch it out which then caused my hamstring to cramp. I tried to get going again but this resulted in a hobble/limp style. A very kind gentleman stopped to help me with my cramp and as I lay on the floor with my leg in the air he proceeded to pray to Jesus to take my cramp away. Not sure if my swearing was not looked upon kindly but no divine intervention came and the last five miles were a combination of walk, stretch, jog and pain! I crossed the line in 4.08 and must admit felt a little disappointed that it was only plan C! I looked at my medal and all disappointment had gone, after all I'm now a marathoner! You may ask if I will do another one? The answer is a big yes. I've got a plan A target to hit you know! Apologies if I have missed you out in my report, there were loads of WRR’s there and loads of supporters too. I love you all… promise! If I refer to slow and or steady, this is just based on what I know I have achieved in the past. We all run at different paces and by no means is it a reflection on a fellow runner, I think you are all blumin’ marvellous! E&OE (which absolves me of everything anyway :) )Those of you that know me, know I have had a tough time of it recently with my running and it was only really Wednesday this week that I decided to take the plunge and plough ahead with the Stafford Half Marathon and BOY was I pleased I did. Stay tuned to hear more about me… oh and a few others! 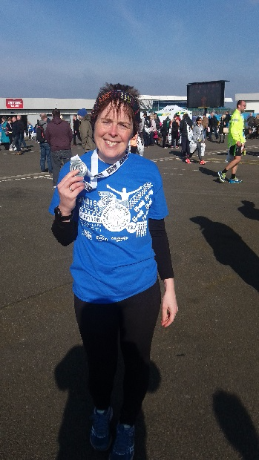 Pauline and I travelled down together, I had already discussed that I wanted to run at her pace as I was in no way going to achieve Paul Sprigg's challenge of sub 2 hours. I would be happy to finish today in under 2:30, or just finish. We met up outside McDonalds for the obligatory WRR photo, the one beforehand where we all look pretty, we really should try and get the same photo after one of these days (although was rather jel’ at the end when Julie Hartland looked gorgeous and like she had just been for a stroll in the park, which of course was not the case). There were a few first timers and the nervous energy by now was palpable. We also had some marathon trainers with us, even asking my advice on whether they should go steady eddie or just go for it. Anyway I pretended like I knew what I was talking about and suggested that as it was 3 weeks away to “just go for it” (please at this point Dave Leonard refer to disclaimer no. 3 above). We headed for the start, Lesley, Pauline and I grouping together; Megan with Dad, Darren OJ to support her on her first half; Paul still trying to persuade us to do his sub 2 group (we ignored him). Mark absorbing the atmosphere, he really loves the build-up and all that tension and excitement. The crowds in the town were just fabulous, cheering, clapping, ringing bicycle bells, good luck boards aplenty, it would have been easy to have motored off, but I stayed true and stuck like glue to Pauline and now Lesley too. We nattered away the first few miles, spoke to other runners about their stories and why they were running, it was all very inspirational and made me even more determined to finish this race. Mile three saw us run past our first supporters since the start, but for the hell of me I can’t remember who was there other than my parents. By now the streets were lined with young, old, families, couples, dogs (canine, I don’t need to refer to any disclaimers) all cheering us on. The children lined up to offer high-5’s and were shouting words of encouragement. We then saw Mick and Julie, on the other side of a loop, they were ahead of us, they made a beeline to high-5 us, both looking fresh and thoroughly enjoying themselves. Ahead now we could see a lovely long hill at mile 5, here’s where I say goodbye for now to Pauline and Lesley and I seem to find another gear and head on up the hill. I check my watch, I’m averaging a 9:35 min pace and I am pleased with that. I have settled into my run and at this stage I am finding it relaxing, but ever mindful of the lack of training recently I pop a shot-block for extra energy. We head out into the country for a while and I am surprised at how rural it seems so close to the centre. By now the sun has come out and I am enjoying the rays on my back, that vitamin D is most welcome and at this temperature bearable and lovely. I spy a water station ahead, I am now at just over 7 miles and although not thirsty, want to take in some fluids. It’s at this point I see the lovely Jenny for the first time. (Sarah I know you say I am loud, but I am certain if Jenny and I went head to head I would have a fight on my hands at who is the loudest). She shouts words of encouragement and even as I pass, I can hear her calling after me “Come on Pol”. I have been by myself running for about 3 miles now, and although surrounded by people I am really relaxed and enjoying my own company, listening to the sound of my breathing and thinking I actually still feel good – don’t tempt fate! And of course just as I am enjoying myself and in my stride, a runner in-front drops her water bottle and of course goes to pick it up, I try to run around her, she however stumbles and ends up head-butting me in the ribs as I go past, ouch that was a bit painful, but could have been worse and of course she shouts her apologies after me… hope her heads OK! I pass Lee and Cherie and by now can see Emma in front, so I pop a little spurt on to catch her up, I’m feeling like a chat again now. I catch Emma at about 9.5 miles and I think she is pleased of the company. We natter away about everything and anything, races we have both done and races we want to do. By now I can see Jenny in the distance who has clearly managed to clone herself as I don’t know how she managed to get to where we are now before us! Further on and we see Allison, Amanda and Kim, all shouting words of encouragement. Emma and I realise we only have parkrun left to go and I’m ecstatic, knowing that I am going to finish. Another block for me, Jelly babies for Emma, which are now being handed out in the streets. Everywhere you look, there are kids and adults with Tupperware, its brill that they want to get involved and have spent some of their own hard earned cash to pay for those, especially as they do hand them out at the water stations. We are now on the tow-path a mile from the finish, that close you can almost smell it! Emma is going from strength to strength and is really determined to finish on a high, by now I have cramp so I urge her to go on if I slow, promising not to stop, but not wanting to delay her progress! I am not sure if I slow or if Emma speeds up, probably both but either way a gap appears between us, she shouts back “come on Polly”, but by now the cramp is really bad and I shout for her to continue, I am still behind you, but having to slow up. Back in the town now and the crowds are roaring and OMG there’s Jennifer again, she is everywhere, I don’t know how she does it, but it’s great that someone puts in that much thought and effort to be in several places to cheer you on (unless it was her twin June Harrower… So that’s 1 clone, 1 twin and 1 real Jennifer. Even though we left Telford in glorious sunshine a foggy start greeted us at the Silverstone race Track - but luckily this soon changed and perfect running conditions arrived. 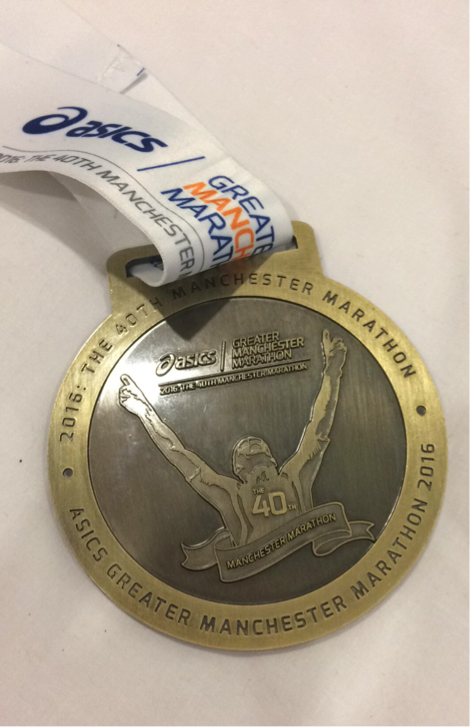 With marathon training in full swing I only had a couple of objectives in mind – 1) try to do the pace Coach Gill had given me, 2) do a sub 2hr half (something I have never done on this course – previous best being 2.05 a few years ago). Once your kit bag is stored in the pit lane garage smooth tarmac awaits - the first and last 2.5-3 miles are on the actual race track with the rest covering the interior & outer perimeter service roads/paths. There is not much of the site you don’t get to see. Crowd support is great on the way round, which of course included my partner in crime Allison Haycox – top cheering by all. 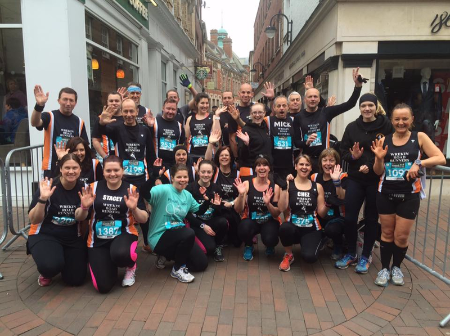 I can happily report that both objectives were achieved – I loved the run!! Some people have asked is the course boring – no. I really enjoyed this event again. It is exceptionally organised, with a fab medal. I would recommend to all! 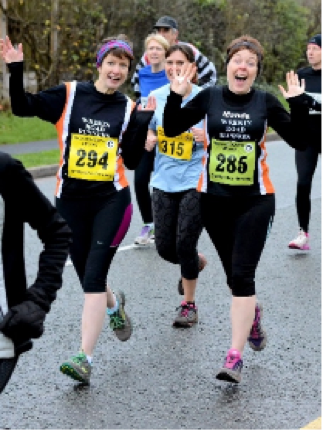 After checking out the race photos for Wheaton Aston 10k I spotted an advert for this race on Bryan Dale’s website. New Year’s Day – no chance! But then I read about the “limp wrist” bit…..
Full of enthusiasm after Wheaton Aston, I optimistically estimated a time of 44:56 (taking into account the amount of alcohol consumed the night before, general weather conditions, the nature of the route, the fact I’d done a long run the day before etc.) and it wasn’t a total guess at all. 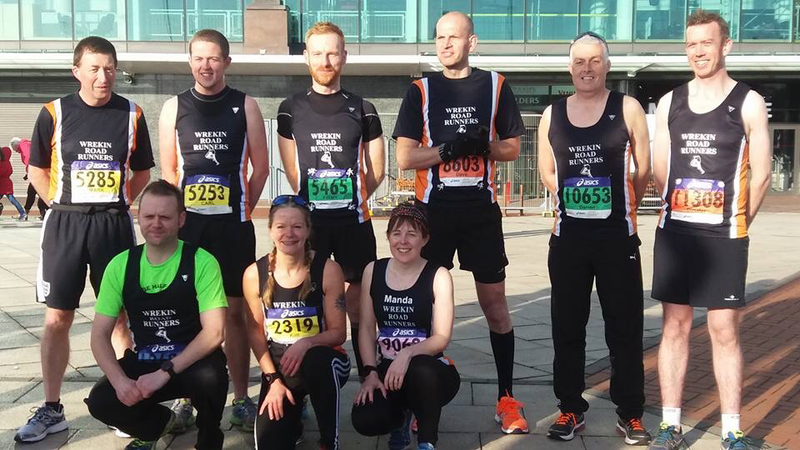 The start was a very laid back affair – registration took place by handing over a fiver and a slip with your estimated time on it to a couple of women sitting in a car parked in Castlefields, Stafford, in exchange for a race number for Shugborough Relays…! They thought it amusing when I asked if there were any toilet facilities but luckily we were in plenty of time to drive to the nearby Tesco (the preferred option to a nearby bush!). On our return, we followed a group of runners down the road to a random lamppost which was apparently the starting line. After a brief announcement indicating that conditions on the route were a bit muddy, we were off. The route circled a small lake, then headed back towards the start, where we picked up the Stafford – Newport old railway line for a couple of miles before running around a marshal stood in the middle of the path and heading back again. I’m not sure what the exact definition of “a bit muddy” is but it wasn’t long before our mincing attempts at avoiding the huge puddles became totally pointless and everyone just waded in! There were several sections where my trainers were completely submerged and I just hoped that there weren’t any sneaky potholes or dog poo floaters to contend with! I got a bit confused when I exited the railway line as loads of runners were milling about, but after asking someone I realised we had to do another loop of the lake before returning to the finish. It was really weird running a race without having a clue how far you had gone (or still had to go) but it was great fun. Everything was so laid back I couldn’t even spot the finish funnel or timekeeper so kept randomly running until someone pointed out where I was supposed to go!